Any conversation about bagels, pizza, burgers or barbecue inevitably brings out the lovers and the haters: folks who adore/despise, or are enthralled by/appalled by the same product. I’m already hearing just that after bringing up the subject of bagels here on All You Can Eat. I chalk-up much of that disparity to Old Hunger — the memory of the way things “should taste” depending on who you are and where you grew up. Which brings me to this post’s subject: I want you to tell me your memory of the perfect bagel. Mine could easily be this one, eaten not too long ago at Barney Greengrass in New York. 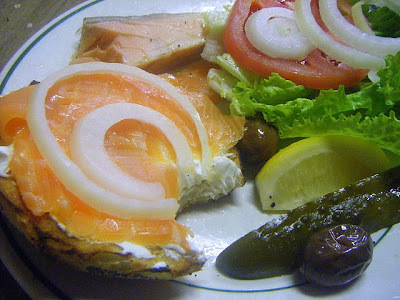 Bagel, schmear, lox, kippered salmon: What’s there not to love? But it’s not that memory. Nor the one of my stepfather’s mother, my Bubba Rose, pulling homemade bagels out of the oven while I watched Shirley Temple Theater on UHF in her row-house living room. I’m in my early 20s, and I’ve driven, alone, to the Orleans movie theater where, as a young girl growing up in Northeast Philadelphia, I first watched (enthralled!) “Love Story” with Ali MacGraw and Ryan O’Neal. And also (appalled!) Ned Beatty forced to “squeal like a pig” in “Deliverance.” I’d love to tell you what the movie was on this particular occasion, but I can’t recall. What I do remember is what I was eating while watching it. Instead of reaching again and again into a bucket of buttered popcorn, I’m reaching into a brown paper bag from nearby Brooklyn Bagels, then located in the crowded shopping strip next to Abe’s appetizing store (you’d call Abe’s a deli). Those bagels — both pumpernickel and for “dessert” cinnamon raisin — were still warm from Brooklyn’s oven. And they were, from that day to this, the most delightful thing I’ve ever eaten in a movie theater. The Orleans, Brooklyn Bagels, and Abe’s & Son are gone now, but like that moment in the theater watching who-knows-what, I’ll still have my memories.